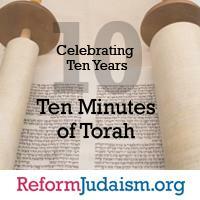 When I announced the creation of the Ten Minutes of Torah project 10 years ago, I had two goals. The first was to reaffirm the simple fact that Torah study is the motor that drives Jewish life. From my first days as President of the URJ, I had suggested that commitment to Reform Judaism—like commitment to Judaism of every variety—always means commitment to Jewish literacy and to study of sacred texts. I had also expressed my concern that there existed a literacy problem in the Reform movement; clearly, too many of our members were wonderfully educated in the ways of the world but abysmally ignorant in the ways of our people, and I noted that any community that neglects Torah study has started on the road to decline. Still, I expressed my confidence that things were changing, and noted that I was seeing in Reform ranks a new appetite for Jewish learning. Ten Minutes of Torah was intended to respond to this change. It was not meant as an in-depth course of study, of course, but as a beginning: A taste of Torah for those in our ranks who were starting their religious search, hungry for the splendor of Judaism’s intellectual heritage. I was confident that once they were exposed to a bit of Torah and text, they would be hooked. They would quickly come to understand that Jewish learning is not a burden but a source of inspiration and a great adventure, and they would be motivated to continue their study with a teacher and a community. My second goal was to reach out specifically to Reform congregational leaders. As I said at the time, my target audience was the group of 20,000 or so board members of Reform synagogues. My reasoning here was that leadership is critical: A small group of committed people can alter the course of history, and religious revival in the synagogue will be dependent on those individuals who serve as role models by taking on leadership tasks. Most Temple board members, I believed, were no longer content to deal solely with budget and administrative matters. Such matters are always important, of course, but board members were now asking far more important questions, such as: What type of Torah lives in our souls? How does the synagogue bring people back to Sinai? Ten Minutes of Torah was intended to help them answer those questions. In summary, then, Ten of Minutes of Torah was meant to be a statement of values and priorities. It was intended to be another step in putting Torah at the center of our movement, and proclaiming that the synagogue can never be a secular entity; it can only be a circle with God at the center, where Reform Jews come face to face with a text-based and literary-dependent tradition. At the same time, it was very much of a practical tool, intended to help and support congregational leaders and Temple board members who were looking for ways to be leaders of the mind and spirit, as well as managers and problem-solvers. 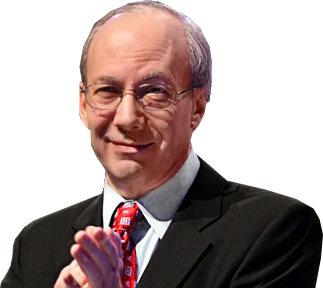 Has Ten Minutes of Torah been successful? Thanks to the devotion of many URJ staff members who have made it a reality, I think it has. It has appropriately defined Torah broadly and inclusively, including Torah practice as well as Torah learning. It has reached a large number of those committed Reform Jews who every day bear the heavy responsibilities—and experience the joys—of Temple leadership, and through them has influenced many more Jews than the 20,000 who read it regularly. And for a large number of people, it has served as a first taste of what would later become a powerful hunger for deeper learning and more intense Jewish engagement. Why am I Happy the ultra-Orthodox Are Insulting Reform Jews?